Androuet is famously known cheese and wine shop for Londoners. Based in the popular eating-out place on the Spitalfields Market it turns into restaurant at night. The place encourages not only by its excellent location but also by a display of sophisticated cheese and a sight of people chatting over a glass of wine. Androuet was opened in October 2009 by the two young and enthusiastic Brothers Leo and Alexander, who love nothing more than their French cheese. The shop operates alongside its sister boutiques in Paris and Stockholm and supplies quality cheese, which comes directly from the best suppliers around the world. One can find here anything from Camembert to Stilton or Roquefort. 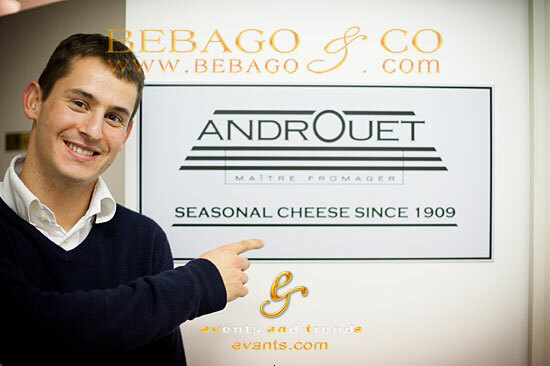 Out of their big passion for cheese, Leo and Alexander decided to open the Androuet Restaurant as an Addition to the shop in the same location in April 2010. The menu of the restaurant features wine and cheese which is sold in the shop and which is maturing in the restaurant’s storage. Cheese lovers can come here for lunch and try nibbles such as cheddar crisps, cheese and meat boards, burgers, salads and sandwiches. However, we particularly recommend trying delightful portobello mushrooms covered in bleu cheese. Once the evening sets in the shop space is transformed into a cosy dining space, which offers some additional seats for the guests. For the dinner among other dishes guests can choose vegetarian tartifflet, baked camabert or Morteau sausage with mashed potatoes. However, the biggest speciality of the restaurant is its cheese fondue. The head chef of the restaurant, Alessando Grano, mixes different cheese together in order to obtain a settled taste of the fondue. The restaurant’s fondue is seved with a range of meat products called chacuterie, bread and fresh vegetables. Wine connoisseurs can combine this special taste with one of the many wines available in the restaurant’s menu. If you want to make your experience full, friendly and well-informed staff will be always happy to give the best advice when it comes to the wine choice. For those who like to finish a meal with something sweet and refreshing, Androuet offers freshly made desserts. One can choose from fancy served sorbets or creme brule topped up with a hint of extravagant tonka bean. The restaurant is dedicated to its long standing customers and serves up to hundred guests a day. Guests of the restaurant have a chance to indulge themselves in a truly french atmosphere and they will never get bored with a menu as it changes seasonally. We would give a restaurant a good 7 out of 10 for a cosy atmosphere, friendly staff and a range of high quality and original cheese dishes. Good news for all cheese lovers is that the owners of the restaurant are planning to expand to the West End in the near future. Androuet never gets empty so make sure you make a reservation.